Sad moment as 26 Nigerian women are buried in Salerno, Italy. The funeral for the 26 Nigerian women who drowned crossing Mediterranean Sea on November 3 has held in Salerno (south of Naples) Italy. It held at Salerno's Monumental Cemetery on Friday morning, with local politicians, rescue workers and journalists in attendance. Prayers were said by a Catholic archbishop and a Muslim imam. All the 26 coffins were laid out with a white rose on top, while two of them also had blue flowers placed on them and they were for two of them who were pregnant. Only two of the coffins were marked with names: Marian Shaka and Osato Osaro. A Channel 4 News reporter, Paraic O'Brien, tweeted a short video from the event. Former Education Minister and Bring Back Our Girls convener, Dr Oby Ezekwesili also tweeted her sadness over the matter. 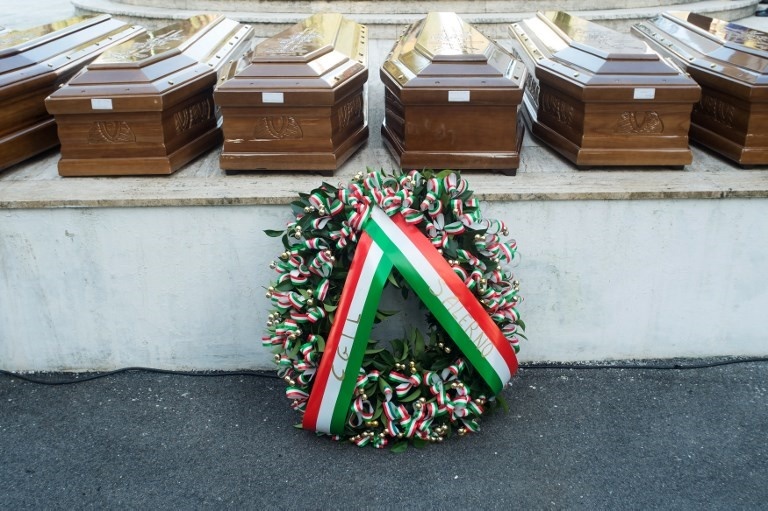 "Our 26 daughters are being buried in Italy today. Oh, that this would be the LAST TIME we’d lose Daughters of Nigeria in such shamefully tragic manner on the Mediterranean Sea!"